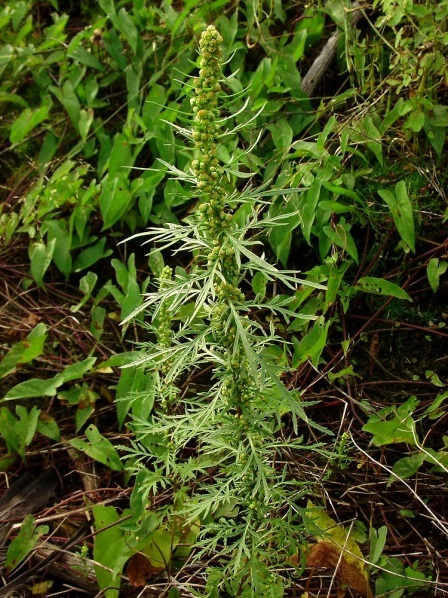 Artemisia biennis is an annual to biennial herb, not aromatic, 30 cm to 3 m tall. Leaves alternate, blade 5-15 cm long, deeply, pinnately divided, lobes toothed to divided. Flowers greenish yellow, very small, in compact heads that arise from a bract-covered floral base (receptacle), flowers tubular, radially symmetrical (disc flowers) only, heads 0.2-0.3 cm high, basal bracts membranous, rounded, nearly covering flowers; inflorescence of very densely crowded flower heads in spike-like clusters in upper leaf axils; Aug.-Oct.
Habitat: Sandy soil, open areas.